Welcome to bill hamilton roofing, inc., where technical expertise, quality craftsmanship and sound business sense come together for all your residential and commercial roofing projects. We are committed to “rising above, going beyond” for all of your roofing needs. We have the technical know-how to be able to offer a full range of roofing services including residential and commercial repairs and maintenance, re-roofing of existing structures, custom-build new construction, real estate services and technical design. Bill Hamilton is a third generation roofer, following in the footsteps of his father and grandfather. Bill remembers first falling off a roof at the age of 6 when he would work clean-up at the jobsites for his father and has been passionate about roofing ever since. Bill’s roofing career has taken him from Arizona to Hawaii and then to California where he began bill hamilton roofing, inc. in 1992. Bill’s expertise has spanned over 30 years and in that time has worked in a number of capacities including “hands-on” for the majority of his career. This experience has given him the tools and knowledge needed to truly be an expert in the field. Bill’s expertise and professionalism is the backbone of the company and why we have built the strong reputation for quality craftsmanship and sound business sense. He is fully immersed in the company day-to-day and is constantly called upon for advice within the company as well as by local builders, architects and real estate professionals. Located in Campbell, California, bill hamilton roofing employs highly skilled and trained installers which specialize in wood shake applications, all types of composition shingles, a wide-range of concrete and clay tiles, standing seam metal roofs and slate. We also take pride in being IB Roof Systems certified for those who have full or partial flat roofs including Eichler homes. 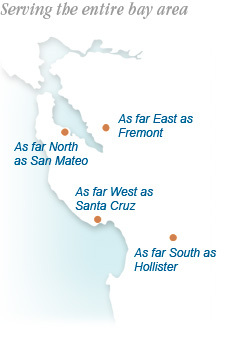 bill hamilton roofing, inc. is proud to serve Santa Clara County, San Mateo County and Santa Cruz County.